Habit: Perennial herb 30--70 cm, much-branched; herbage glabrous. Leaf: 20--60 mm, thick, +- ovate. Inflorescence: glabrous or glandular. Flower: calyx 3.5--6.5 mm, lobes ovate to +- round; corolla 18--24 mm, gradually expanded into throat, throat 4.5--8 mm wide when pressed, pink, magenta, or red-purple, unlined, glandular outside and inside (floor lacks nonglandular hairs); anther sacs dehiscing full length; staminode included. Leaf: entire to moderately serrate; distal cauline leaf bases free, cordate-clasping to rounded. Flower: anther sacs 0.8--1.3 mm, spreading flat; staminode glabrous or sparsely hairy. Chromosomes: 2n=16. Ecology: Rocky hillsides, rock crevices in creosote-bush scrub, juniper/pinyon woodland, chaparral; Elevation: 400--1800 m. Bioregional Distribution: PR/DSon; Distribution Outside California: Mexico. Flowering Time: Mar--May Note: Variable; hybridizes with Penstemon centranthifolius. 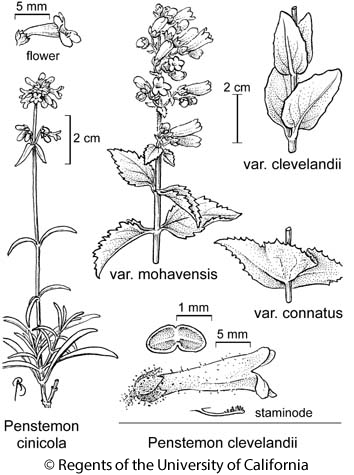 Citation for this treatment: Margriet Wetherwax & Noel H. Holmgren 2012, Penstemon clevelandii var. clevelandii, in Jepson Flora Project (eds.) Jepson eFlora, http://ucjeps.berkeley.edu/eflora/eflora_display.php?tid=76763, accessed on April 20, 2019. PR/DSon; Markers link to CCH specimen records. Yellow markers indicate records that may provide evidence for eFlora range revision or may have georeferencing or identification issues. Purple markers indicate specimens collected from a garden, greenhouse, or other non-wild location.